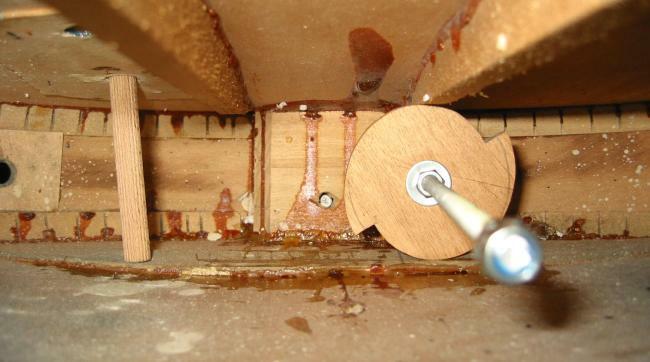 Fran�ois : I had bad luck with the H56 Roy Smeck model. I bought one from ebay, but the seller never sent it (he expected more from the auction I guess...). I had to fill a claim at Paypal to get back my money. 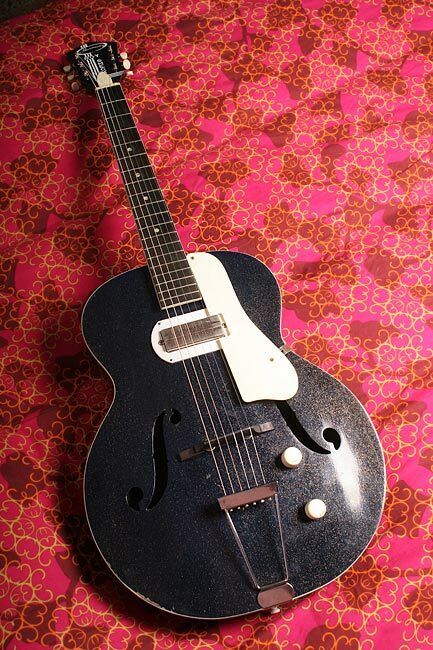 Then I bought this one, for a "normal" price. It was supposed to be in good shape but no : the top was badly sagged and the neck joint was moving. Anyway this model has the nice blue with golden sparkle finish, overall it was well preserved apart from these dried glue problems. The seller was dishonest but I didn't paid a coollector's price, so I loved it anyway. I decided to fix in no time. 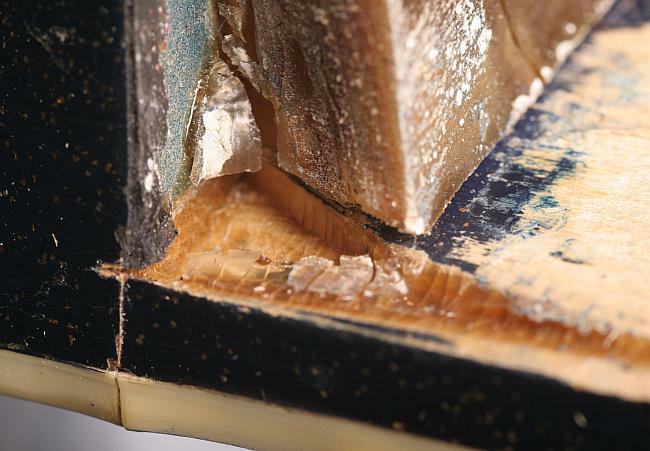 No need to ask why : from the f-hole, it's easy to see that the internal bracing is unglued. 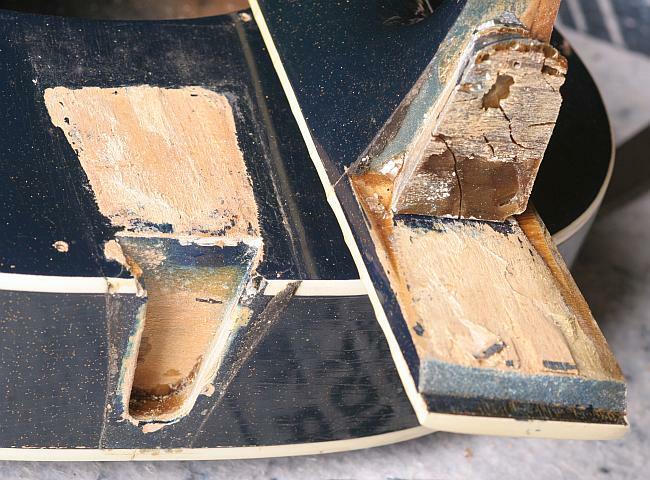 Below, an internal view confirms the two main bars are completely unglued on about a third of their length. 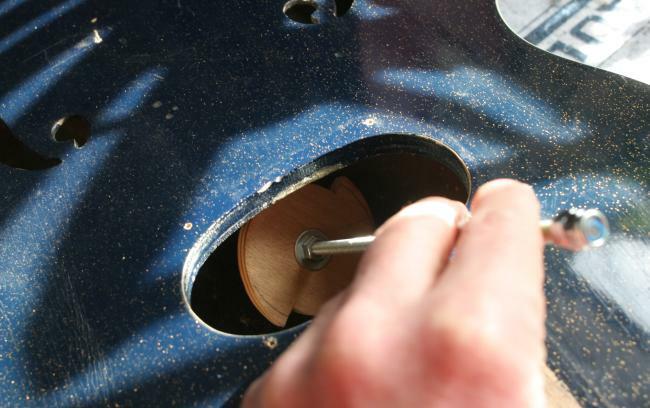 On this photo we see the bars stop where is the rectangular plate around the oval hole for the pickup. 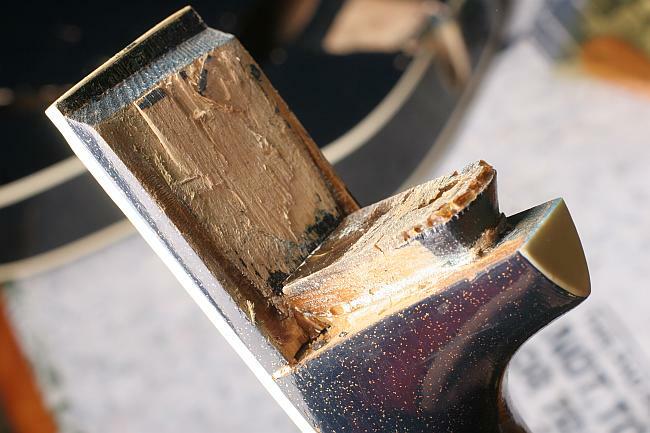 Reglueing the top braces was the easy part of this restoration, because clamping was easy through the large pickup hole. Sorry no photos of the clapms, but here is the result, of course the top now has a more pronouced arch... I used titebond glue, as you can see fropm the yellow drips.. I'd say this design with the braces stopping in the middle of the top is not what Harmony did best. 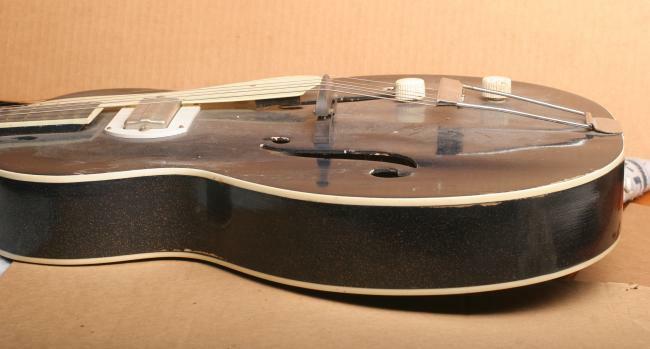 It seems this H56 with one pickup has a solid birch top, and this would need solid bracing to keep its arched shape. 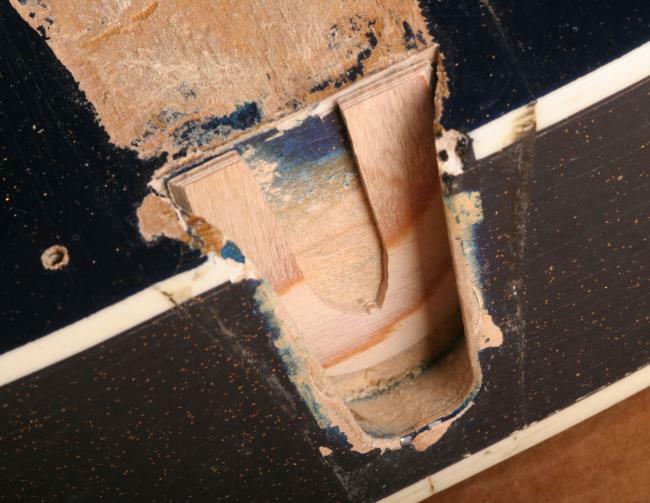 On the two pickups guitars (H58 Roy Smeck, H62... they used laminated woods, a far better solution, as I guess the different plies of wood were glued while given the arch...). 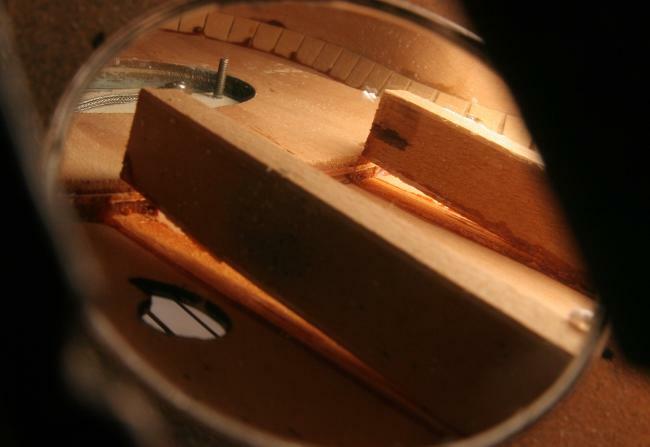 Now, the neck is already moving a lot in its joint, so the only thing really holding it in place is the fretboard extension, still glued on the top. 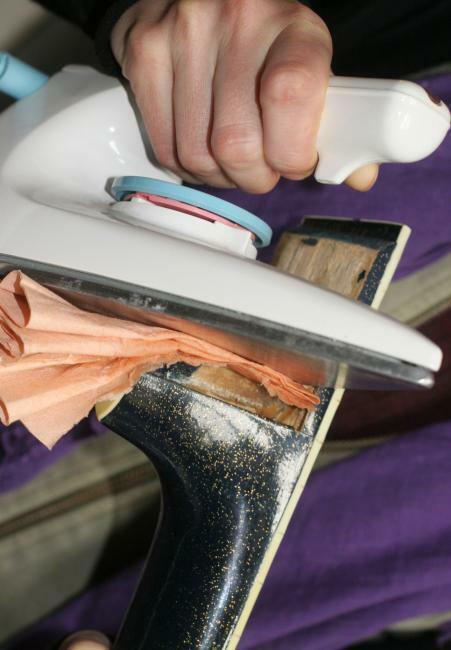 Here I am heating it to soften the glue. 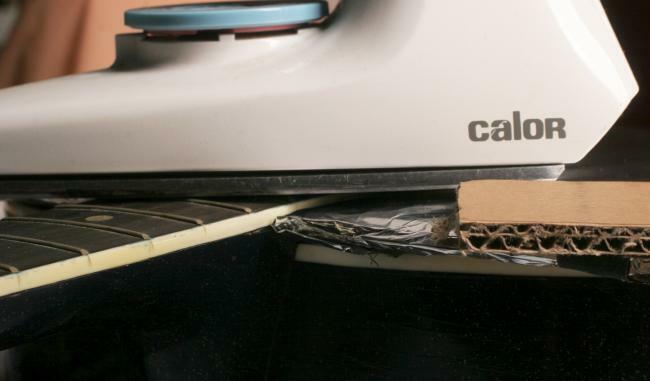 The thick cardboard wrapped in aluminium protects the guitar top. 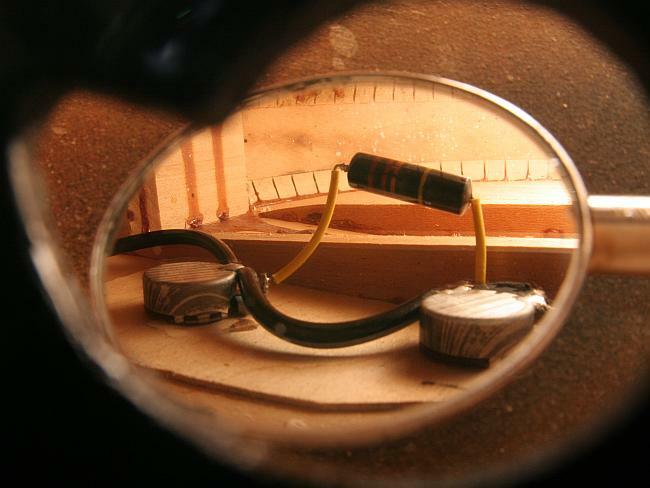 On the photo below, I put a piece of the naked cardboard on the left just to show it's thick. 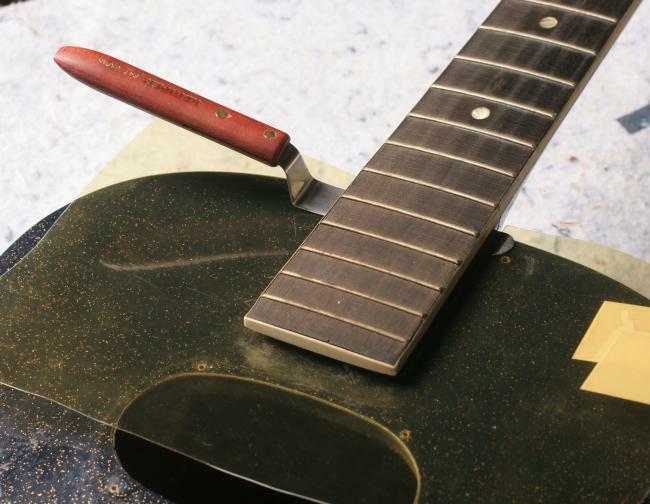 Here I work with this special knife (from Stewmac) to separate the fretboard extension from the top. A little at a time, I had to heat several times but it was not difficult to complete the separation. 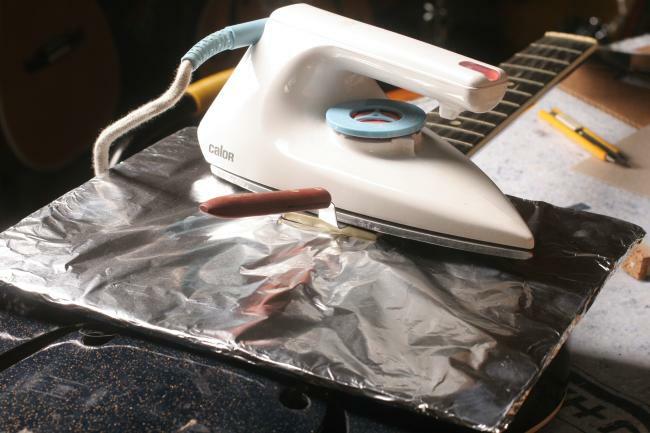 I did not want to heat too much, I was afraid to crack the (very dry) fretboard or to melt the plastic fretboard binding. I was surprised by this big thick layer of glue on the whole end of the neck. 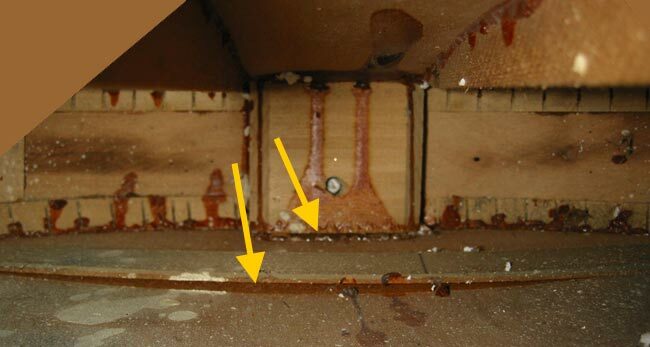 See on each side of the joint, they carved some "pockets" in the wood, I suppose this was intended to receive the excess glue when clamping the joint. 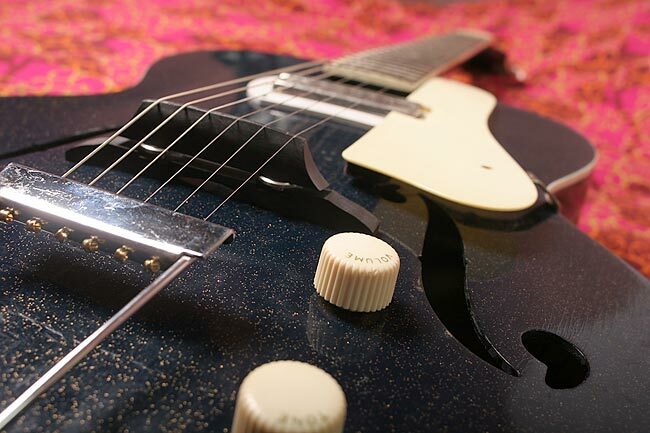 I checked this on photos from other Harmony necks as well (hey, that's my first "unset" !). Below, there is smoothed angles on each side (yellow arrows). I saw this also on other Harmony joints. 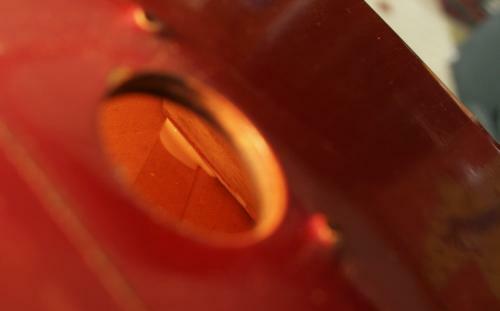 The red arrow show some black residue from a filler used to joint the heel to body sides. I'd say this was original. OK, let's reconstruct it now ! 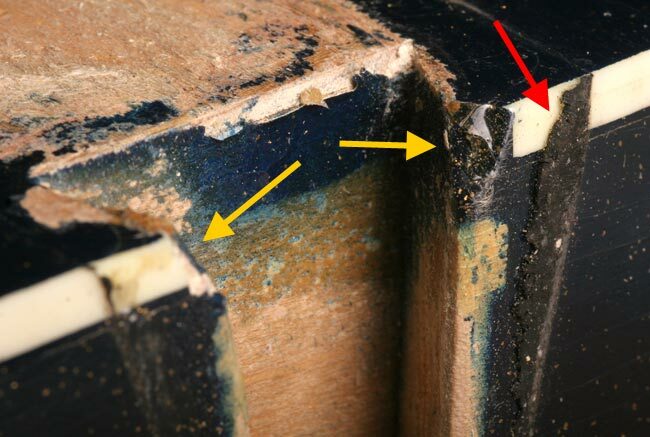 I knew I have to reglue the big bars under the top, but the flat brace, and the end block are unglued from the back too (see yellow arrows below). 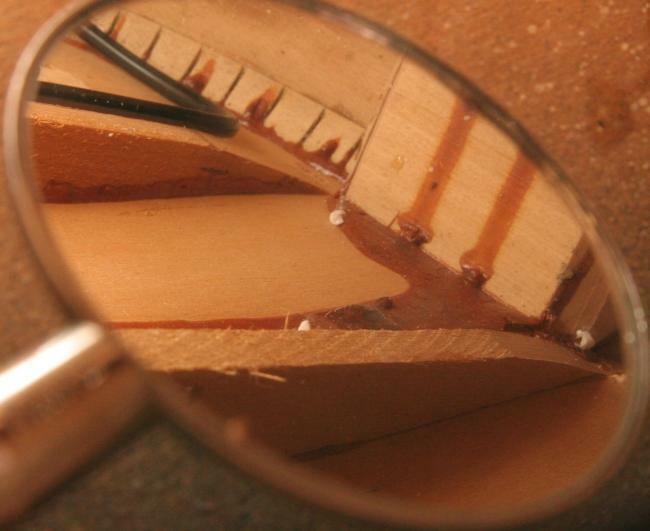 This gue joint between the back and the end block is very structural, I have to reglue this before applying string tension again. Re-glueing these was the most difficult task in my project, because of accessibility. 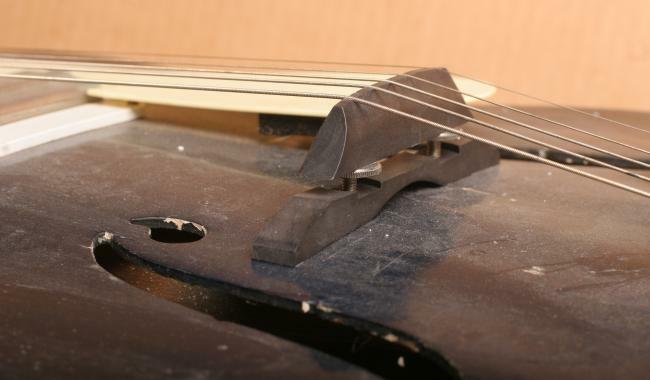 How to put glue inside a archtop guitar, and how to clamp things the right way ? 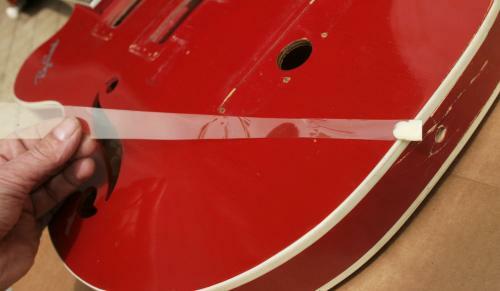 Fortunately this one is an electric, and has a large big oval hole for the pickup. 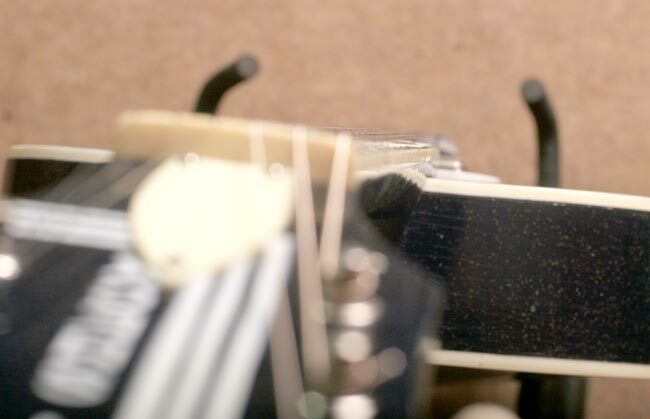 You can't really put your arm in there, but it's less difficult than in a closed acoustic. 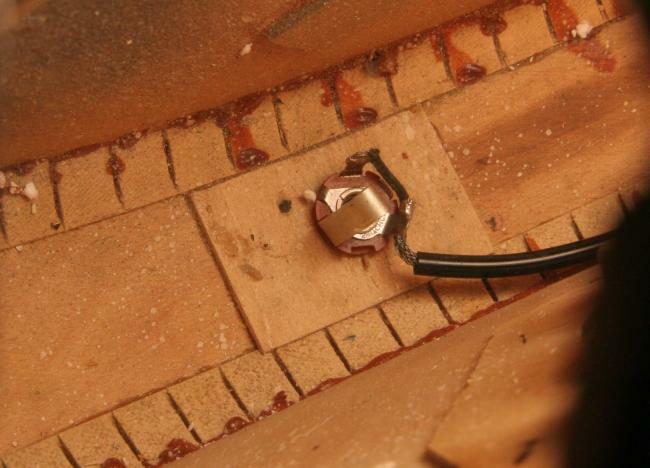 For a similar job (reglueing the end block) on a H73 slim line, I had use the plastic (celluloid ?) thing below, I was using it through the f-hole (shown in working position below). 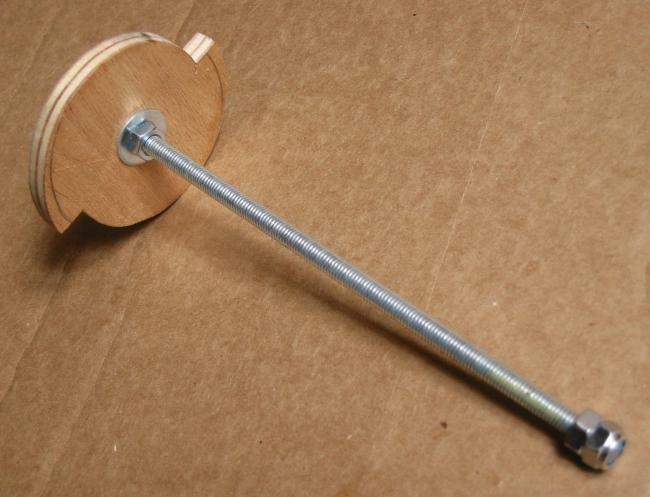 Then I wanted to build something more handy, ie with a more stiff "handle", to feel what I'm doing. 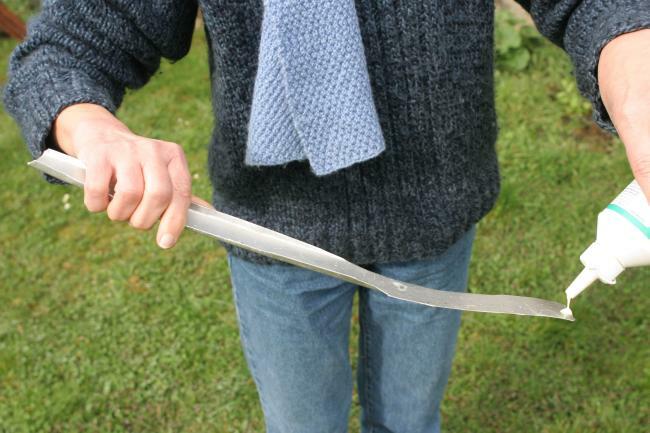 First evolution was the wooden handle below, with the same plastic taped at the end. The ned of the wood has a wedge, the end of the plastic itself is filed to be very thin, so this tool can bring glue under many braces. 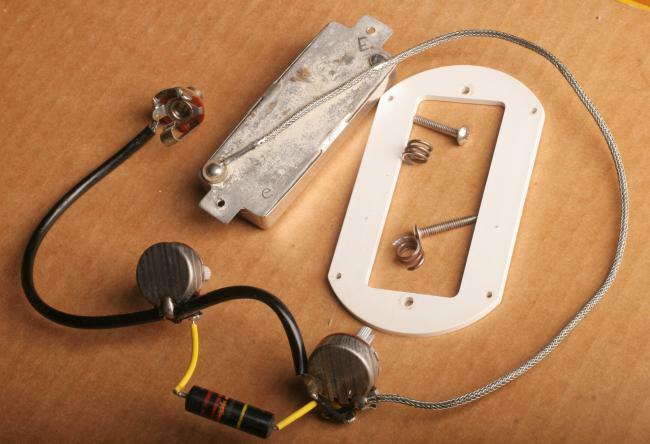 For this H56 project, I have a better access through the "big" oval pickup hole, so I built the high-tech aluminium tool below. The high-tech part is to fold the sides on two third of its length, to add rigidity. Seriously, I just used what I had on hand and it was aluminium. But it work great ! The idea was to be able to push enough glue under the end block, and to do it as quickly as possible, because I wanted to use hot glue. 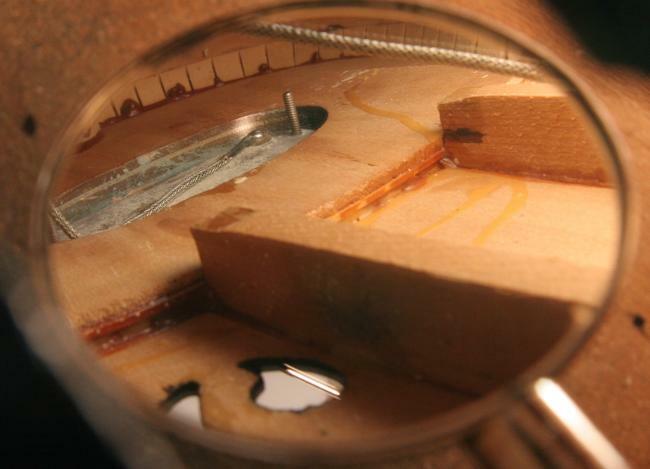 That's the original glue, I had no acces to clean the old glue, and it should ease the process of removing the back for the next generation of luthiers, an important thing to my eyes. Below, my girlfriend is demoing the tool for the photo, but in real life I used hot glue under the end block, and white glue (titebond) under the flat brace. 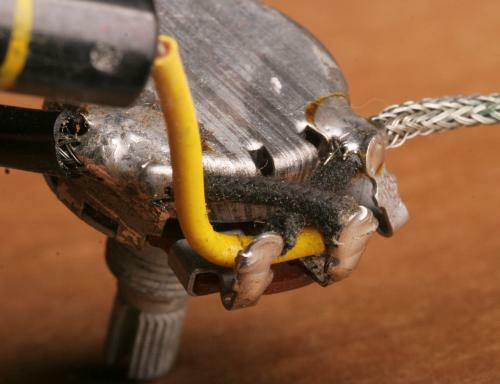 I used a full teaspoon of hot glue on the end of the aluminium thing, and I did this twice before clamping the end block from outside the body. This was an easy clamping situation, I did not made any photos. 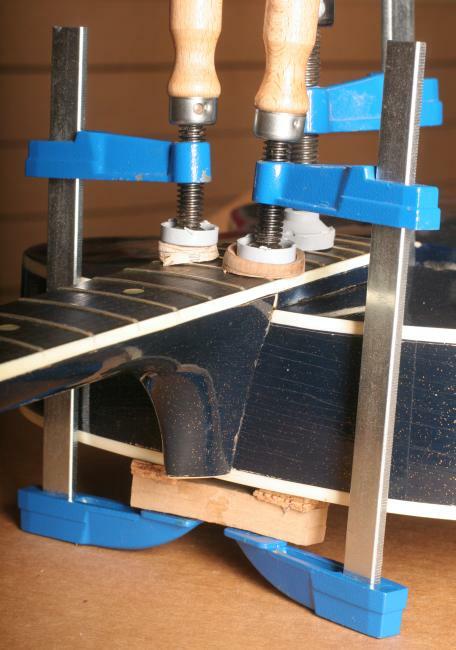 Now I made another tool to clamp the flat brace from inside the guitar. Photos should be self-explanatory. 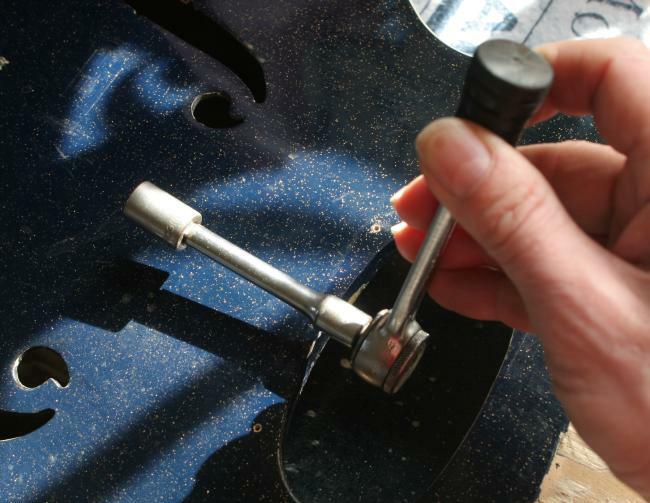 I introduced the double-cam tool through the oval hole, then I was able to rotate it with the tool shown. While rotating, it push on back and top of the body from inside. 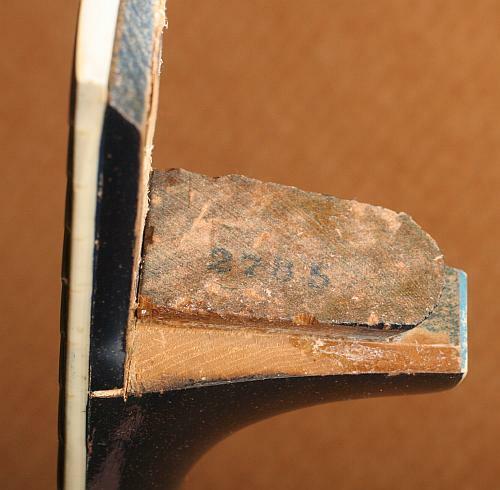 It worked great to clean to bare wood, and a hidden number was there (2385), no idea of the meaning, my guess is that the other part of the joint (neck block inside body) was stamped with the same number at the factory, during the building process. 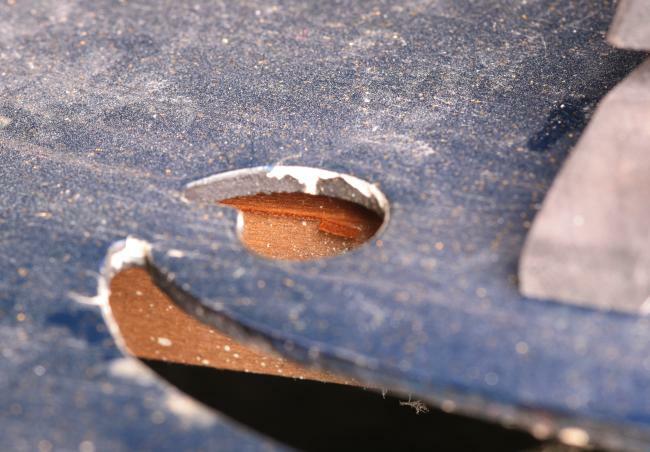 Then I made a shim from heavy duty plywood, to put in place of all tghis glue that was in the joint. I did not took any photo, but of course I have checked the neck/body angle, with the usual straight rule laying on the frets. The ned of the rule was at the top of the bridge (bridge adjusted all way down). 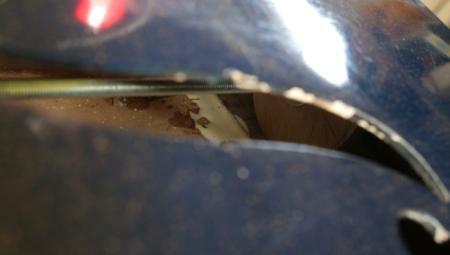 As I had given back a real arch to the top of the guitar, I felt I did not have to change the angle from origin. That's what I was able to confirm with the rule. 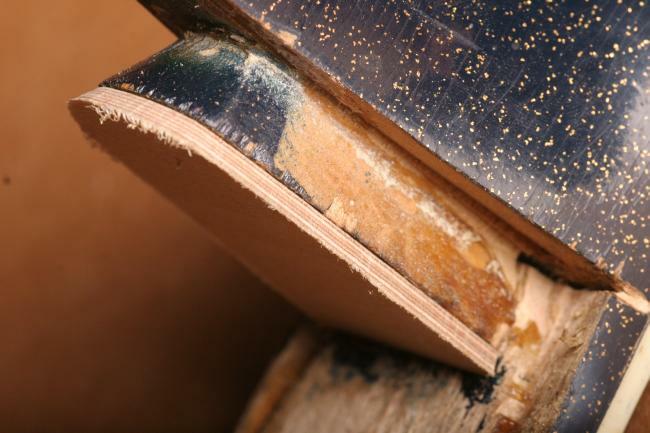 I carefully sanded this to fill exactly the space, often assembling neck and body, untill I was able to slide the neck in place to the bottom iof the joint, and without any play when I moved the neck back and forth. 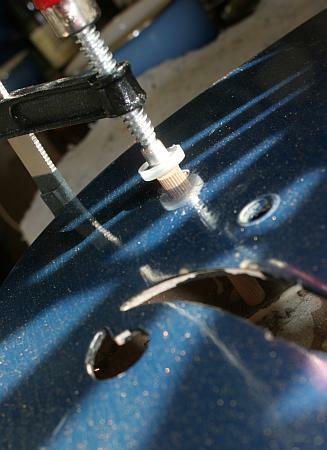 Then I used hot glue (sorry no time for photos with hot glue...) and clamped it for a full day. 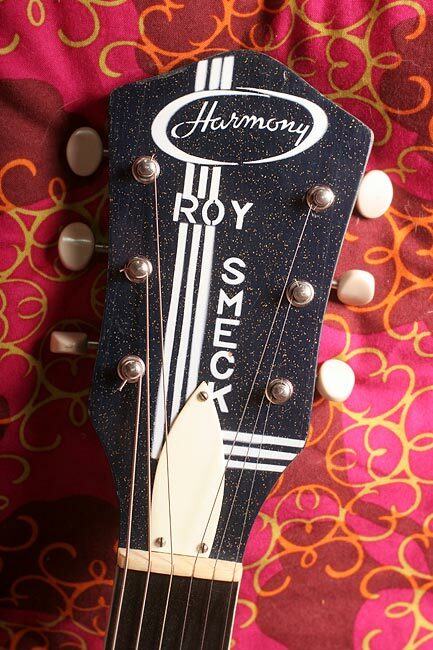 The Harmony H56 Roy Smeck was used in a David Bowie video !